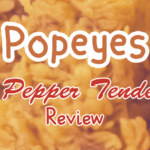 Today, instead of describing a foodstuff that is currently available as the time of this publication, we will be reviewing a fallen limited time offering that was felled in its prime. Today, we will be lighting a candle in memoriam for one of the best fast foods we have ever had the pleasure of eating. 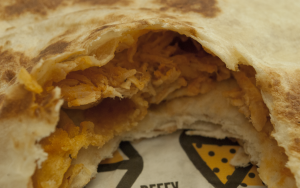 Today, we remember Taco Bell’s Crunchwrap Slider. 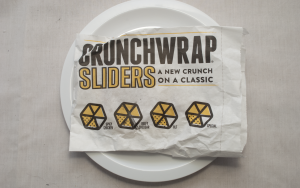 Humble in demeanor, but big in spirit, Crunchwrap Sliders lived a life full of zest, full of flavor, full of… I’m sorry, I – I just… have something in my eye…. Sob! The Crunchwrap Slider was based heavily on its larger and older cousin, the Crunchwrap Supreme (which was introduced in summer of 2005 as a limited time offer, and became a formal menu item in 2006). 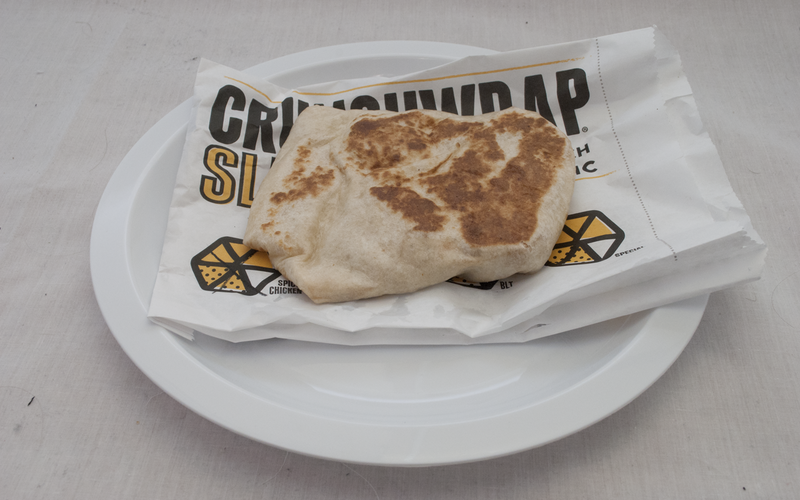 Though the Crunchwrap Supreme was basically a glorified soft-shell taco, it had the unique novelty of being wrapped up like a discus-shaped tortilla sandwich, and it was the Supreme that started a series of similar menu items, such as the A.M. Crunchwrap and – yes, the subject of the review – the Crunchwrap Slider. The Crunchwrap Slider came in three variations: Beefy Cheddar (seasoned beef, nacho sauce and shredded cheddar cheese), Spicy Chicken (marinated shredded chicken doused in chipotle sauce), and BLT (bacon, lettuce, tomato, and avocado ranch sauce). The real star that brought the crunch to these Crunchwraps, however, were the Fritos chips included in each wrap. All wrapped together in the same style of grilled flour tortilla that they use for the full-sized Crunchwrap Supreme, it was a surprisingly hefty bundle for what it was worth. For something described as a “slider”, these things were gigantic! Though they weren’t as big as the Crunchwrap Supreme, they made up for it in caloric value and flavor variations. The Crunchwrap Slider was introduced on December 22, 2014 for the low price of $1, and then turned $1.50 a month later until eventually being phased out in March in favor of the Chickstar and its many variations. We ordered the Beefy Cheddar and Spicy Chicken for the purposes of this review, as the cashier advised us that they were better than the BLT. I kinda feel bad for the workers who have to mark the flavors. The Beefy Cheddar Crunchwrap Slider was the “primary” slider and the simplest, with only beef and two cheeses as the filling. Each slider was loaded with nacho cheese sauce, which – although it was flavorful and tangy – took center stage over the rest of the ingredients, drowning the beef and making the Fritos soggy. Shredded cheddar cheese was promised, but was almost undetectable when melted together with the nacho sauce. 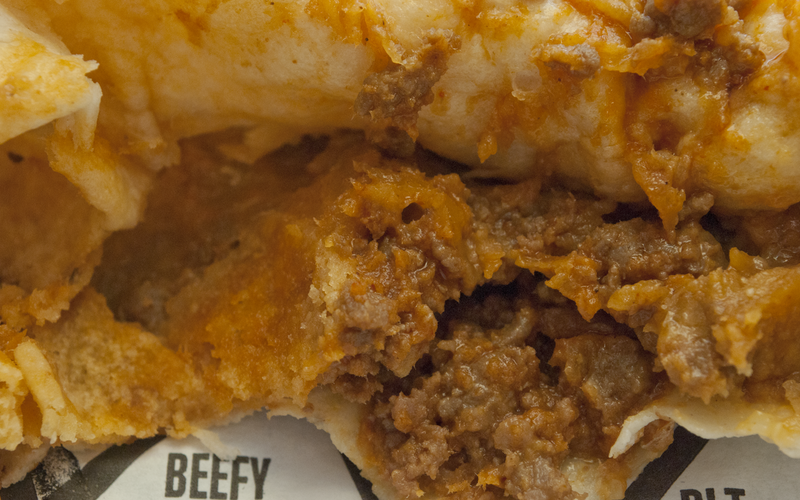 The beef was Taco Bell’s standard “seasoned beef” – dry and chewy, but well spiced and flavorful. As much as the beef needed that cheese sauce for essential moisture, sometimes the cheese and beef were sporadically placed with pockets of both separate from each other, with huge inconsistency between orders. That’s a lot of griping for something that, when it comes together, just works well enough to work over its shortcomings. Beef and cheese is Taco Bell’s standby for a reason, so there wasn’t really a lot to complain about: it was the safe zone, and it worked. 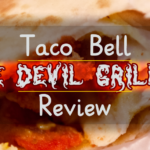 The Spicy Chicken Crunchwrap Slider, although not as heavily advertised as the Beefy Cheddar, was just as memorable. Instead of cheese, this shredded chicken-based wrap featured a spicy, creamy chipotle ranch sauce. As with all the other Crunchwrap Sliders, the final ingredient was crunchy Fritos. Despite its simpler components, we actually found the Spicy Chicken Crunchwrap Slider to frequently be the preferable choice. The chicken was much more tender and moist compared to the beef option, while the chipotle sauce carried a smoky heat that left our lips tingling. Without the overwhelming flavor of cheddar cheese, we were even able to enjoy the flavor provided by the tortilla, leading to an extremely well-balanced wrap. The best part was that the chicken was mixed together with the chipotle sauce, instead of it being squirted around like the Beefy Cheddar, which gave it a more cohesive texture, better content distribution, and less inconsistencies from order to order. While chicken has never been Taco Bell’s strong point, this Crunchwrap was a real winner. Normally chicken and ranch would simply blend in as a “plain” choice for the unexplorative, but the simple additions of spicy chipotle and crunchy Fritos made this a real winner. Overall, a common complaint we had was that the Fritos were almost invariably stale. They were still frequently crunchy and provided the right amount of salt and corn flavor, but it was a real disappointment to bit into a mouth full of Fritos that had gone soft. If you got lucky, the tortilla wraps could be surprisingly crunchy in themselves as the grilling method added pleasant char on the top and bottom, but sometimes they were just soft and pale. The real factor leading into our final rating was the sheer caloric density and flavor for a dollar menu item. Taco Bell’s dollar menu is already satisfying, but the Crunchwrap Sliders were above and beyond. Upon reflection, these Crunchwraps were very similar to pre-existing dollar menu items – namely their dollar quesadillas and the Beefy Fritos Burrito. 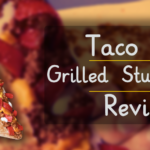 For those who want to relive the experience of the Crunchwrap Sliders today, we suggest trying those items (especially the Beefy Fritos Burrito, which is identical to the Beefy Crunchwrap Slider with the addition of Latin rice). 5 out of 5 – Simply Superb! Even though it wasn’t anything new, Taco Bell did what they do best: affordable quantities of protein combined with spicy sauces. 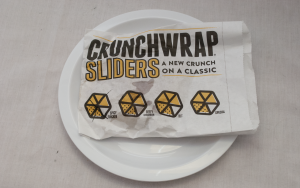 The loss of the Crunchwrap Sliders was a devastating blow to the quality of the Taco Bell menu, especially with the mediocre replacement that was the Chickstar wrap. In the end, although the life of Crunchwrap Sliders was a short one, it was a life well lived. 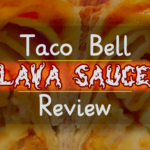 Through the ups and downs of its existence, it was a solid member of the Taco Bell family that slid into the niche of cheap, filling, tasty food like a glove. 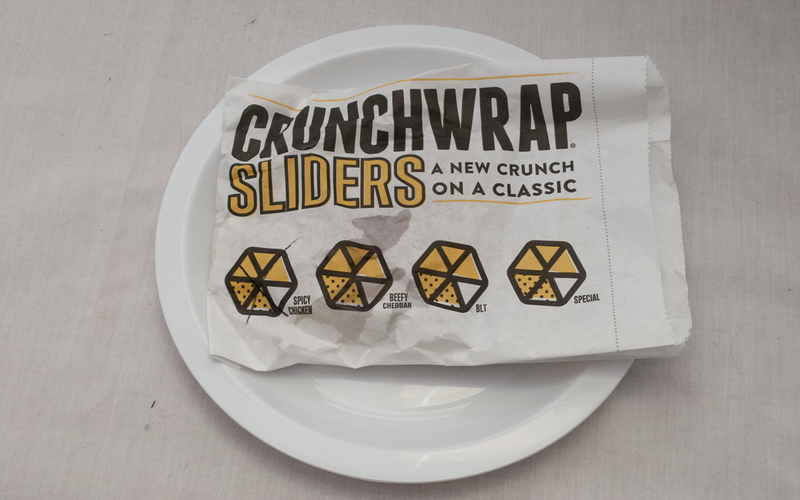 We will miss you, Crunchwrap Slider. And we will pray, one day, for your return. Thank you all for coming. Please join us for the reception where refreshments will be served.